2 weeks of waiting time since it's launch in Jakarta. ZenMotion doesn't support custom gestures. You can only use the built-in one. PokdeGold Award worthy. Need I say anything else, really? If I had mentioned the name “Samsung Galaxy S6”, or “HTC One M9”, or “LG G4”, you could immediately configure your mind into positioning these devices as “high-end” devices because these devices don’t come cheap. And we expect them to perform, after all you buy these gadgets with your hard-earned money. On top of that, because these devices are extremely expensive, they are not easily dispensable. I would need to spend on a handbag for SuperMommy before I spend on the next one anytime soon. But what if I told you that I’m holding a device that costs one-third of your idea of a high-end device but delivers undivided superiority? Perhaps even better than your high-end device? In our mindset, if it’s going to cost one-third of the price, it’s going to be right in the mid-range or low-end range. But let me tell you this, you are wrong. Take off your ASUS Zenfone 5 hat if you are wearing one. Even the packaging has been innovatively horizontalized! Look. If you think I am going to be biased in my review, just read this paragraph without reading the rest of it, then head to the town, validate this fact, and if it’s true, come back for the rest of the article. Chances are, you might just end up buying it there itself. The body of the ASUS Zenfone 2 is arc-ed in such a way that it just feels perfect in your palm. You could have a larger palm, or you could have a smaller one. But you definitely form an arc shape of your palm when you hold a mobile device. See, you are looking at your palm now. I was right, no? So to complement the naturally arc-ed shape of our palm, the back of the ASUS Zenfone 2 is designed to fit just perfectly. The brushed metal texture blended on the plastic back case is seriously not slippery and it feels firm in the palms. Okay, now you may head to your nearest store and validate this first fact. Simplicity has a new name. The sides of the ASUS Zenfone 2 are empty. There are no buttons – at all! The power button is at the top and the volume button has been shifted to the back. ASUS decided to be innovative, but this is the first time you don’t have to worry about which accidentally pushing buttons when you hold it wrong. You are supposed to be able to decide on how and where you want to grip the phone at and not be blocked by some buttons on either side. This is where knowledge of user experience comes into play. You would only notice the difference when you actually hold a ASUS Zenfone 2 yourself. You would not believe how comfortable it is holding this device! Done already with the mid-range or low-end range mindset? Indeed, the ASUS Zenfone 2 has a variant with 4GB dual-channel DDR3 RAM and it’s the one that I have in my hands right now. Is there any difference in 2GB vs 4GB, you ask? Hell yeah – A big one! Especially if you are going to give it the Android 5.0 Lollipop breath! We have approached the times where idle phones are easily hogging 1.5GB of RAM (some, like my Samsung Galaxy Note Edge even hogging 2.3GB on idle!). You would demand plenty of memory to run bulky applications in this case. The ASUS Zenfone 2 totally has it! The ASUS Zenfone 2 sports the Super Quad-Core Intel Atom Z3580 2.3GHz (codename “Moorefield”). We brought the 22nm processors into mobiles, yo! And for your gaming, there is a PowerVR 6430 GPU clocking 533MHz with OpenGL 3.2. Combining this, the ASUS Zenfone 2 churns out a super fast touch response time of only 60ms. Know what that means? A blink of an eye takes 300ms, so the ASUS Zenfone 2’s touch response is 5 times quicker than that! That is not too technical for you? The processor inside the ASUS Zenfone 2 is based on the same technology that was first introduced in the 3rd Gen Intel Desktop Processors (codename “Ivy Bridge”). It utilizes 3D Tri-Gate Transistor technology that provides triple amount of surface area compared to single plane (or planar) transistors. This allows a higher number of electrons through due to a higher surface area. This also means the transistor switching performance is much more efficient and power leakage decreases. Out of this, we get higher performance at low voltages and almost twice the power! Just the perfect combination isn’t it? Ask any desktop computer owner, what was the revolution in the Ivy Bridge processors that was legendary. This is the answer you would be getting. The next question you would be asking me is what about the battery life with it having that many horses under the hood? 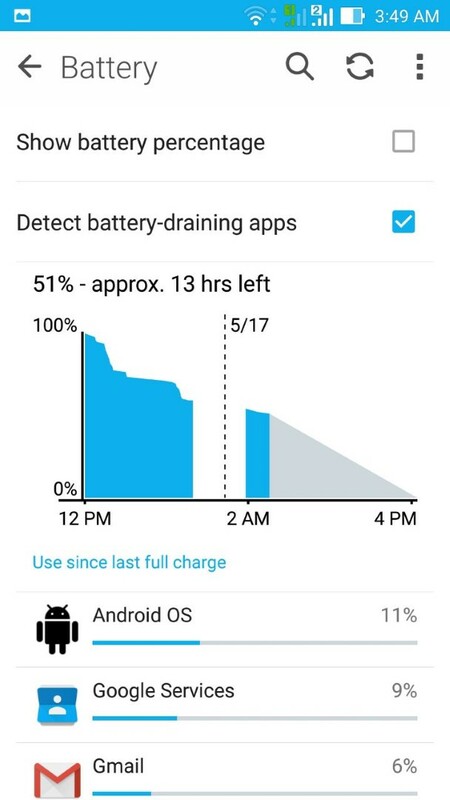 I unplugged this device at 12pm today, and at 2am (14 hours later of continuous usage), I’m still left with 51%, approximately another 13 hours to go! Take a look at it yourself! Don’t ask me about the battery. I still have 51% after whole day usage! Did you see how much on screen time usage? Once again, let me prove you wrong that only high-end devices can perform awesomely. I took the ASUS Zenfone 2 to test against my Samsung Note Edge. Both devices were rebooted and running at their stock ROMs on idle, followed by immediate benchmark testrun. On the Samsung Note Edge, I got a total score of 45875. On the ASUS Zenfone 2, I got a whopping 46773! Then there was an OS update for (WW_2.15.40.13_20150506_3876_us_er_rel that was supposed to improve “stability”. Upon updating, I got an even higher score of 47246! Let the screenshots do the talking! On the back of the ASUS Zenfone 2, you will spot a 13MPx camera bearing 5 element lens manufactured by the infamous Largan Precision, capable of taking pictures at f/2.0 aperture with dual tone flash for natural colors. There you go. One single sentence to describe the awesomeness the PixelMaster Camera has. Up front, we have 5MPx PixelMaster Camera 2.0 with 85° wide-angle lens for the selfie addicts. The PixelMaster’s Low-Light Mode is definitely still the highlight of the day. Using this mode, you can capture low-light mode images and videos in under 1Lux lighting. The algorithm behind PixelMaster’s Low-Light Mode identifies details in the dark and automatically enhance the light sensitivity. Using pixel-merging technology that joins four adjacent pixels to form a new pixel, the light sensitivity is increased by 400% so you can take pictures in the dark without even using a flash. Then we have the Super HDR. If Low-Light Mode combines four adjacent pixels, the Super HDR captures multiple shots that are then merged to create a detail-revealing HDR shot. The multiple shots are captured at different EV settings, and later is dynamically adjusted by detecting the environment lighting every second. Finally the Super HDR post-processing algorithm performs local area detection that expands the dynamic range up to 4 times that the picture can have 400% more brightness, contrast and details. And this is how you get super vivid natural pictures from the ASUS Zenfone 2! Note that I am saving the camera review for my heads-on post coming up next. Since I got myself the red Zenfone 2, the interface was also matched by default. I’ve used too many devices in my life and I used to be a huge fan of HTC’s Sense UI. When ASUS bought over the Sense team and formed its ZenUI team, I knew the results would not be disappointing. I even proved that in my ASUS Zenfone 5 review last year. This time around, ASUS has upped the ante by making it even more simpler, smarter and yet giving more personalization options! With more than 30 native dedicated apps, you can say that ASUS has really put their love in delivering the utmost experience to their end-users. The ZenUI 2.0 is brighter, smarter, simpler and very beautiful! The stylish new layout expands white space for a cleaner design, placing the information you need front and center. I had to emphasize on this because I am a UX/UI Engineer myself and the toughest part in this field is balancing the whitespace perfectly. Just look at how beautifully the icons are spaced! Then they have included the ASUS ZenMotion that allows you to create just about ANY shortcut. While the display is off, scribble a “C” on the display to run the Camera app. Write a “W” to launch the World Wide Web browser. Or gesture an “S” for SMS. You wouldn’t realize it, but the less buttons that you have to press to reach your final destination is a big part in the User Experience understanding. Now, after reading this article, it’s totally up to you to decide on which version to get. ASUS has brought ample options to spoil you with choices. As for me, I have the 4GB RAM instead of 2GB because you can never have enough RAM, 32GB instead of 64GB because there is an option for SD Card for my storage, Glamour Red because it has haunted me in my dreams since I saw it in Jakarta during its launch and Z3580 2.3GHz processor because I’m serious about my mobile gaming. What’s your choice? ASUS 100 Days of Zen — chance to win a Zenfone 2! Boleh dikatakan jimat, saya yang menggunakan ASUS Padfone S yang menggunakan Wi-Fi hanya tahan sekitar 14 jam sahaja, SuperDaddy pula hampir sepnuh masa menggunakan DATA. Maka saya boleh katakan bahawa ASUS Zenfone 2 ini jimat kuasa antara faktor utamanya adalah nanometer 22nm yang digunakan pada unit pemproses dan Tri-Gate transistor. Yes, there is a lot of response I received from my friend who using Zenfone 2, they love the camera and battery lifetime. Have you guys tested out the battery performance when hardware encryption is enabled? Encryption will naturally use more battery and event dont find it necessary for my personal use. So we did not do the test. Sorry. I juat bought a Zenfone 2 64 GB and it went well until I found that it had a problem of downloading some apps in its Play Store. This just happened 2 days ago. Can we know detail about what application you having difficulty to download. The battery performance well and important is the set the Auto-start Manager to optimized the battery with apps installed. What I can accept is the powerful rapid charging which able to charge upto 60% within 40 minutes. Use ZenFone 2 (4GB and 64GB), so far so good. very impressed for the one hand operating function where customized screen size on your 5.5″ screen where you can easy work using one hand. Saya pengguna zenfone 2 …Saya tak boleh view pdf file yang sudah di download…bermacam pdf reader dah cuba di muat turun tetapi masih tidak boleh digunakan..ada suggestion tak? Boleh kami tahu apa yang terjadi apabila buka file pdf tersebut? Sudah kemaskini kepada versi yang terkini? Resit m2u tak boleh nak buka walaupun dah banyak pdf reader saya guna. Ada penyelesaian tak? Resit tersebut sudah simpan dalam format PDF kan, jika dah dalam format PDF memang takda masalah hendak buka. Saya cadangakan guna Adobe reader. Any idea whether mode ZE551ML (32GB) is now available in Kota Kinabalu, Sabah, Malaysia yet? Please advise. We aren’t sure about the availability the 32GB at Kota Kinabalu, but you can order it directly from ASUS Malaysia store here : http://store.asus.com/my/category/B4396?_ga=1.265739983.1790207765.1427902878. To be note only 2GB/32GB version is available right now, if you are waiting for 4GB/32GB, i’m suggesting you directly send a message at ASUS Malaysia facebook page. Zenfone 5 sy guna, next upgrade zenfone 2 lte. Mmg berbaloi2…. saya tak boleh download game yang besar seperti gameloft dll. Sy nk tahu , kalau kita beli zenfone sealed box , apa lagi yg dapat selain charger dlm kotak tu ? Kandungan kotak Zenfone 6 yg saya beli tahun lalu- phone, charger & earphone. Kotak Zenfone 2 hanya ada phone dan charger sahaja tapi penjual tu bagi saya plastik screen cover & gas station power bank yg cantik (inisiatif penjual to beat the competition). Satu persaingan yang bagus, konsep win-win dimana pelanggan juga yang untung. hye , can i know whether zenfone 2 is better than i phone 5s? actually the fake zenfone 2 is available in market , so how could we differentiate the fake and the original one? The easiest way would be to only buy from official ASUS retailers. May I know where did you find the fake Zenfone 2? Do you mean AP sets? Well between the iPhone 5s and the Zenfone 2, it depends on your preference. I prefer the customizability of Android, while some prefer the convenience of iOS, so it’s really down to your own choice. Hi Amy, anda boleh semak harga ASUS Zenfone 2 di laman sesawang ASUS. Di atas bahagian kanan anda akan lihat varieti ASUS Zenfone 2 yang bermula daripada RM 599 dan ke atas. In Tawau, Zenfone 2 8GB -RM599, 16GB -RM749 & 32GB -RM899. Those are the standard prices in ASUS dealer shops here. I did my survey just last Wednesday. I’m sure they are sold at the same prices in KK as well. It’s same like KL pricing. How lucky people this year, it take about RM900 last year to get a device that pack with 2GB RAM and 16GB ROM. Nowadays with that price we can get 2GB RAM and 32GB ROM. Mcmne plak dgn zenfone 5 n 6 jika dibndingkn dgn zenfon 2?sy bru nk berjinak2 dgn asus..xtau pn nama model telefon asus…hrp dibntu..
Zenfone 4, 5 dan 6 adalah telefon pintar siri Zenfone yang dikeluarkan oleh ASUS pada tahun lepas, pada masa itu Zenfone 4 atau Zenfone C (selepas nama ditukar) adalah telefon bajet Zenfone, Zenfone 5 pula di tengah-tengah juga merupakan siri yang paling terkenal dan diminati ramai. Manakala Zenfone 6 pula adalah siri Zenfone yang memunyai skrin paling besar pada masa itu. Kini ASUS telah keluarkan ASUS Zenfone 2, bagi saya Zenfone 2 adalah penganti bagi semua siri Zenfone 4, 5 dan 6. Ini kerana Zenfone 2 mempunyai kategori harga daripada RM599 sehingga RM1299 mengikut spesifikasi. Jika nursyam ingin membeli telefon pintar ASUS Zenfone, di cadangkan lihat senarai harga dan spesifkasi di laman sesawang ASUS Malaysia dahulu. Dari segi prestasi ASUS Zenfone 2 memang sangat berbaloi untuk dimiliki. Cuba clear data dan cache untuk facebook dan youtube. Anda perlu log masuk ke aplikasi tersebut selepas langkah di atas.